With his album gaining glowing reviews across the board in the last few weeks, Distance returns to his Chestplate imprint for two more crushing dubstep axe grinders. The haunted atmospherics of the album are dropped in favour of heavily compressed and serrated edge guitar lines presumably jarred out by the man himself, and glued to rock solid drums on a Pendulum-do-halfstep thing with 'Victim Support. 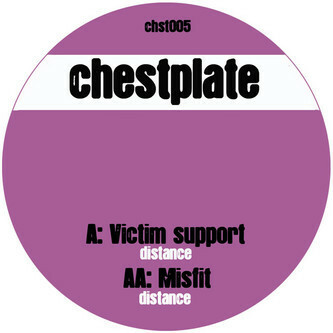 'Misfit' over on't flipside rearranges the formula slightly with yet more axe wielding fixed to a heavy skanked riddim with OTT maximalist production values to induce bruxist brukking in metalstep circles.